Who did he get Killed?? He/she isn't on the ballot. Now what are you going to do? Vote for the person less likely to use our nuclear codes in a fit of pique. I said less likely, not that I trust either. I did say I kind of hoped Trump and Sanders would win the nominations because it would make for an entertaining election. I got half my wish and he has exceeded my wildest expectations of him. I don't see how anyone can follow this prophetic direction if they vote for Trump or Clinton. I will not vote for an evil candidate, not even to keep a more evil one out. I would abstain from voting (or write in) before I would ever put my name behind truly evil candidates. I am not going to stand before the Lord one day and say that I consented to the election of truly evil people. No, she is however responsible for her own reaction, including if she tries to intimidate a victim of her husband's. If murder wasn't illegal... .
Every US president has gotten someone killed. Trump has never been in position to do so, and God willing, never will. All it takes for evil to succeed is for good man/women to do nothing. Only one of two people will become the next President of the US(Trump or Clinton). Voting for any third party candidate is as effective as voting for Mickey Mouse. I'm no fan of Hilary, but the very thought of a Trump Presidency turns my stomach, and scares the bejesus out of me. But both are evil. Choosing evil is still choosing evil. I am not going to stand before God and say I chose the abortionist over the adulterer or vice-versa. I find nothing in scripture requiring us to choose either. Whether Trump or Clinton becomes President means absolutely nothing. Both are evil. Both will offend God. Both will prevent the nation from prospering. Choosing to stand with evil of any kind is the wrong choice in my opinion. And President Benson's too. We had a whole thread on this quote and it's murky origins. I don't think it is a direct quote from a prophet when it was based on a 15 year old recollection from a private conversation. Still sounds like a correct principle to me. I truly wish both candidates would step aside. I think they are both corrupt. Voting third party for a candidate that has no chance to win to me is the same as not voting at all because your vote has no effect on the outcome. I can respect that if that is what your conscience requires. I will look at the whole picture surrounding this election and choose a candidate that on policy, most matches my concerns for our nation as a whole. But Clinton has already and it was needless. You should read, "Hillary's America," It will CFR this and more. "Hilary's America" ranks up there with "The Protocols of the Elders of Zion". What makes this difficult is when a letter from the first presidency, is read in church yesterday and encourages/admonishes us to participate in the process by voting. What do we do if we're not sure of either one? I'm all for voting anyone now that doesn't have a past/character like the two candidates. Or maybe I'm a bit up in the air about voting Hillary, Jeanne might need to fill me in on why I shouldn't. I'm no fan of Hilary, but to say she is evil is an exaggeration at best. Hilary is not an abortionist. She is pro-choice. There is nothing in Scriptures that support a democratic republic like ours, either. In fact all Christians hope for the day of a Theocracy, even the LDS ones. The same President Benson who firmly believed blacks in this country were in league with the Communists. Who set up his own little spy committee at BYU to ferret out liberals, and small "d" democratic idea's. Who spurred on antagonism to science. 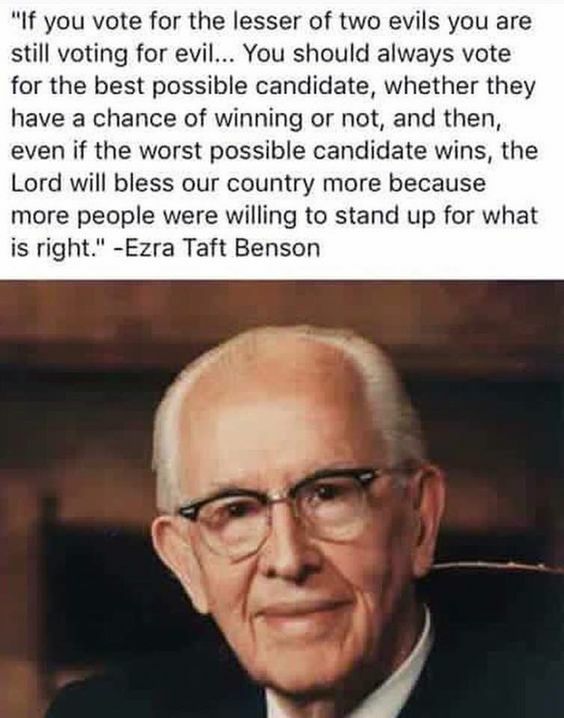 As president of the church, Ezra Taft Benson, published teachings about the theories of evolution. In 1988, he counseled members of the church to use the Book of Mormon to counter the theories of evolution. He wrote that "we have not been using the Book of Mormon as we should. Our homes are not as strong unless we are using it to bring our children to Christ. Our families may be corrupted by worldly trends and teachings unless we know how to use the book to expose and combat the falsehoods in ... organic evolution. As a watchman on the tower, I feel to warn you that one of the chief means of misleading our youth and destroying the family unit is our educational institutions. There is more than one reason why the Church is advising our youth to attend colleges close to their homes where institutes of religion are available. It gives the parents the opportunity to stay close to their children, and if they become alerted and informed, these parents can help expose some of the deceptions of men like ... Charles Darwin. I supported him in his role as President of the Church, but many of his other idea's were extremely lacking. And after looking at that, evil is definitely the right word. Her abortion positions are extreme. It's definitely evil. The one that got me is she voted no on prohibiting partial birth abortion except in cases of maternal health. I can't believe pro-choice supporters don't view that as murder. That doesn't answer the issue of abortion. Which men and women of good will can, and do, disagree. I agree with the Church that abortion should be safe, legal, and rare. I agree with the scripture that says shedding of innocent blood is an unforgivable sin. I guess the truth hurts. We have the internet now, where we can verify facts. When The Protocals Of The Elders Of Zion was published in Russia, in 1903, there was no way of checking sources and facts. It isn't anywhere near the same rank. While Trump may be scary, If you truly did your homework you would be far more scared of Hillary being put in office than of Trump being put there. A write in vote for Mr. Potato-Head it is then! "Hilary's America" was written by Dinesh D'souza a convicted felon. I'm no fan of Hilary. At least she knows what the Nuclear Triad is. She at least knows that waterboarding and worse are War Crimes. That taking the oil is a War Crime. That it is banana republicans that want their political opponents jailed. That reneging of the Sovereign Debt is prohibited by the Constitution. That Treaties are equal to the Constitution. That most eastern European countries are members of NATO. The list of things that Know Nothing Trump and his supporters don't know is long and extensive. Do not be so foolish! Suppose you found your brother in bed with your wife, and put a javelin through both of them, you would be justified, and they would atone for their sins, and be received into the kingdom of God. I would at once do so in such a case; and under such circumstances, I have no wife whom I love so well that I would not put a javelin through her heart, and I would do it with clean hands.